Laura is one of the most perfect movies ever made. A mystery over a murder, unrequited love and a twist at the end come together in this 1944 film, directed by Otto Preminger. It earned several Academy Award nominations. For those five people out there not familiar with this movie, the Laura of the title has been killed just inside the door to her apartment before the story begins. Laura Hunt was a successful advertising executive, much loved by the people in her life. With love comes jealous and even hate as New York City police detective Mark McPherson discovers. Those closest to her are also the main suspects: newspaper columnist and her mentor Waldo Lydecker; her gigolo fiancé; and her wealthy socialite aunt who also has been having an affair with Laura’s fiancé. McPherson learns who Laura was through her letters, diary and inner circle. As he discovers what made this woman so charismatic, he begins to fall in love with her. And then the real Laura walks in the door. It is unforgettable when McPherson, played by Dana Andrews, falls in love with Laura while gazing at her portrait. It’s a sexually charged scene enhanced by Andrews taking off his jacket. So is the next moment when Laura, played by Gene Tierney, walks back into the apartment with that hat framing her face. The movie briskly moves as it delves into the characters. Although released during 1944, this black and white movie should not be considered film noir. Instead it is more romantic suspense with large infusion of noir. But until recently, I had never read the source material—the novel Laura by Vera Caspary. This 171-page story has been re-released by The Feminist Press at the City University of New York. The slim volume is a handsome book that includes an in-depth discussion of the novel, the film and Caspary’s life. While there are certainly differences between the novel and the movie, as there always are, both are equally enthralling. I know that may be heresy to even suggest that a film may be equal to the novel, but there it is. Laura, the movie, is pure perfection. Tierney and Andrews ooze sexuality and the chemistry is evident. Clifton Webb is imperious as the snobby and controling Lydecker. And Vincent Price slithers on screen as the fiancé who is up for sale. 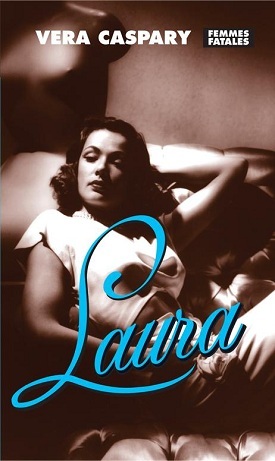 Laura, the novel, was originally a seven-part serial published in Colliers from October through November 1942, and titled Ring Twice for Laura. It was published as a complete novel in 1943. 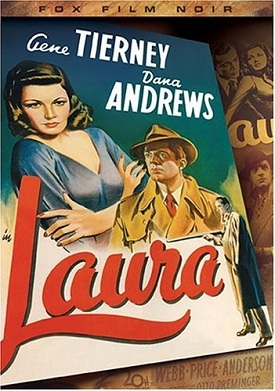 In addition to the movie, Caspary co-wrote a play version of Laura in 1946. It was produced after the movie's success. It was recently revived at the Post Theatre in Highlands, NJ. In the novel, Waldo is quite heavy and had a physical relationship with Laura while in the movie he is viewed more as a mentor and best friend. But the novel holds up as well as the movie, which I think I will go watch again.